* Credit to the South Side High School Alumni Association for the above picture. Picture of postcard compliments of Classmate John Rondot. The Boardroom of Hall's Guesthouse was reserved for the Friday night gathering starting at 6PM , and Hors D' Oeuvres Buffet was set out for the Classmates enjoyment. It was delicious, including Shrimp Cocktail. There were 24 Classmates and 13 significant others in attendance. The main event Saturday evening started with a cash bar cocktails at 5:30PM, at 6PM, a sit-down dinner buffet was provided with Prime Rib, Cod, and Chicken entrees. There was a brief program and time on the portable microphone for classmates to share memories, changes in their lives, etc.. There were 34 classmates in attendance and 24 Significant others, and a great time was had by all. The Guesthouse regularly has a Sunday morning brunch buffet, and as in the past, at 9:00AM 20 gathered for the last event. Here's a little nostalgia for some of you! Remember- The Candid Gallery is open to all classmates to contribute. Please add names and or captions where appropriate. 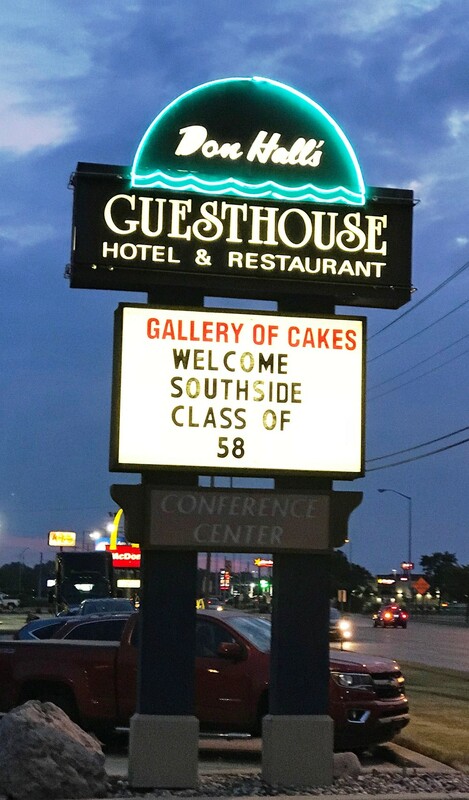 Welcome to the South Side High Class Of 1958 web site. This is a work in progress, please be patient and feel free to make any suggestions as to the sites content. Please create your own login and password, and feel free to add photos to your page, tell everyone what you are doing, etc. I would suggest that you visit www.classcreator.com and peruse the FAQ section. Any ideas you get from there or any other class's or school's website please suggest them to me and I'll try to incorporate especially for each classmate's profile page. The FAQ section suggests several methods to locate missing classmates. I'd like to set a goal to locate all 100% of our classmates; and I could use some help reaching that goal. The list is now a site page listed as an item on the left side menu. Let's work together and make this a CHAMPIONSHIP site like the class's basketball team!